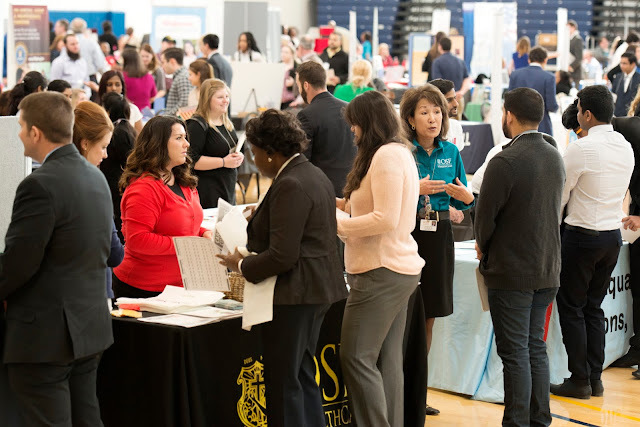 Businesses and organizations are encouraged to register now for the Career Connections Expo at the University of Illinois Springfield. This year marks the 20th year the career fair has been held at UIS. The Expo will be held on Thursday, February 15, 2018, from 11:30 a.m. to 2:30 p.m. in The Recreation and Athletic Center (TRAC) on the UIS campus. The annual event is being hosted by the University of Illinois Springfield, Lincoln Land Community College and Benedictine University. The Career Connections Expo is intended to bring students, alumni, community members, and employers together to discuss career opportunities and build professional connections. Organizations who are recruiting candidates for job and internship opportunities are invited to participate in the event. The event has an average attendance of over 400 students, alumni and community members. Table assignments will be made on a first-come, first-served basis. Employers are encouraged to register as soon as possible as space is limited. The priority deadline to register is February 2, 2018. Employers can register for the Expo through the UIS Career Development Center’s online system called “CareerConnect” accessible at www.uis.edu/career. The “CareerConnect” system allows employers to establish a company profile and post career opportunities at no cost. UIS students and alumni are then able to view and apply for positions directly through the system. For more information or to register for the event, contact the UIS Career Development Center at 217-206-6508 or employerrelations@uis.edu.